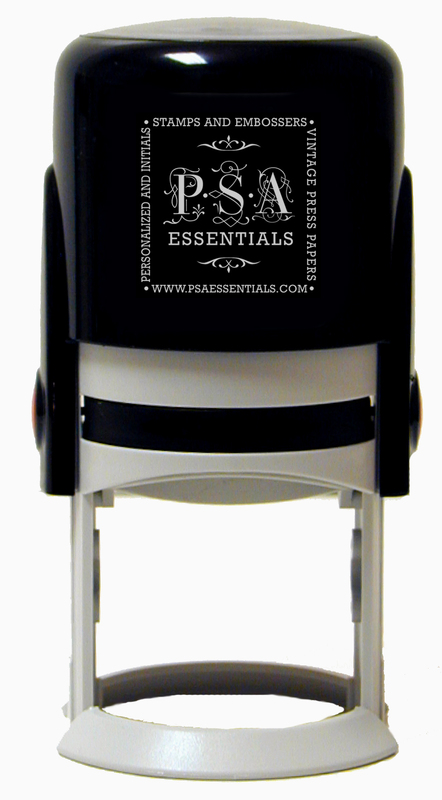 What it is: PSA Essentials is a company that makes custom self inking Peel and Stick stamps, stampable notecards, ink pads, and embossers. Did you catch that? Peel and Stick? 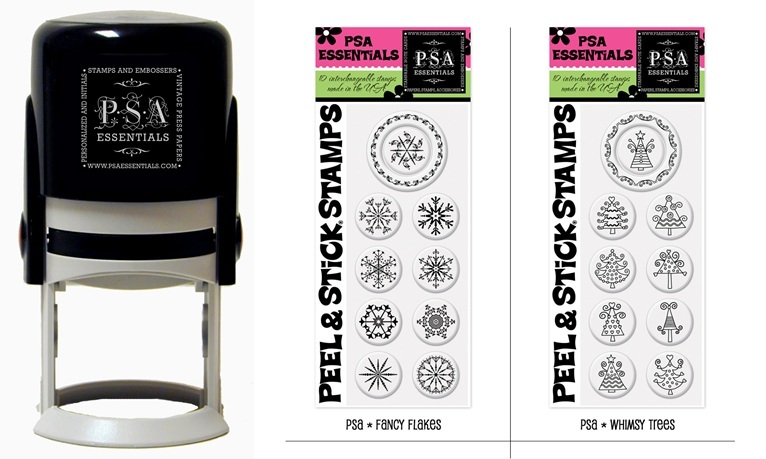 You are probably asking yourself “what are Peel & Stick stamps?” PSA Essentials has developed a self inking stamp body that allows you to add (and remove) clear polymer stamps. Each stamp has an outer ring and middle, these two pieces can be separated (on most designs) and swapped. 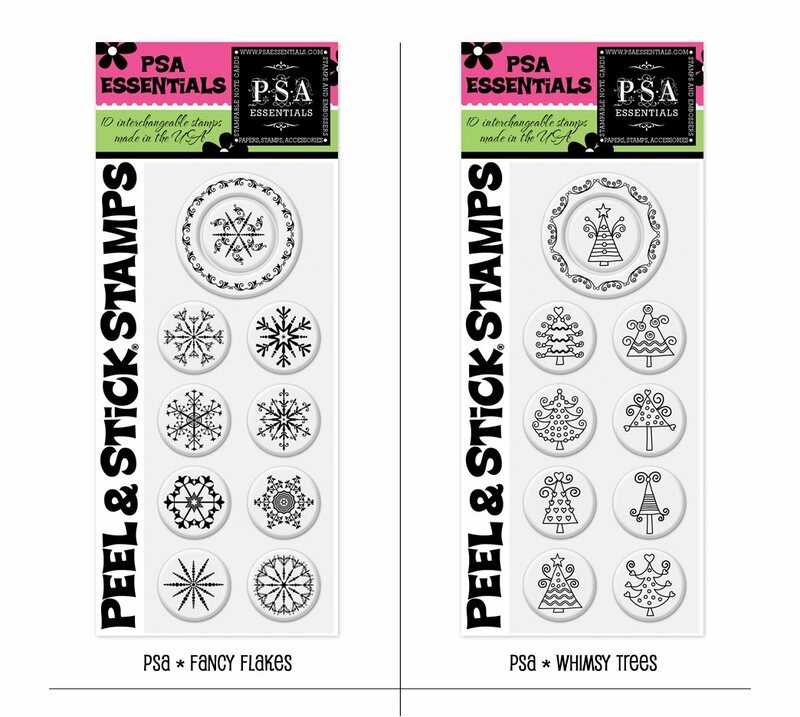 Their patent-pending technology allows the design (of the stamp) to be interchangeable with any of the other PSA Essentials stamps.. You can have your address in the outer ring and a seasonal image, monogram, or even one of the many different licensed characters in the middle! I can’t forget to mention that the ink cartridges are interchangeable and there are 22 different colors to choose from. You’re not just limited to black, like most self-inking stamps. They have even developed a tool that helps you align your stamps before adding them to the stamp body to assure you’ll get a perfect image, every time. The Peel & Stick stamps can even be used with a clear acrylic block! -I love that you can mix and match your stamps to create just what you want. -I love that you can change the color. -I love that you only need one stamp body. That’s a HUGE space and money saver. -They have licensed characters like Snoopy and Hello Kitty! -Changing the ink pads can be pretty messy, if you’re not careful. -The stamps are super sticky, so pulling them off the stamp body can be tricky. -It's hard to determine exactly where the stamp is going to land when you are using it. I'm sure practice would make perfect. Bottom Line: I am impressed with these stamps. They are really well made, there is a ton of stamps, all seasons and styles and sooo many colors to choose from. You aren’t limited by much other than a bit of a mess when changing things out. You don’t have to worry about over inking your stamp or the image rocking when you use it. You get a nice clean image. I will definitely be buying one of these with my home address on it in the future. What do YOU think? Is this something you would buy? What do you think of the interchangeable images? Leave a comment by midnight EST on Tuesday and win a set of your own personalized stamps! WOO HOO! Adorable! I love the Snoopy stamps. These sound nice! I would love to have a personalized stamp. These look like so much fun. I've never seen anything like it. It looks like a lot of fun! TFS! These look fun. Interchangeable stamps would be pretty practicle. Looks like alot of fun! Love that there are lots of different ones. As long as they are good quality & stamp clean images, I guess I could live with the messy changes! Those stamps look great. Kind of like the stamps from 7 Gypsies. I'm not a stamp, but if the ink pad is built in then I would definitely try it out. I hate dealing with stamps, stamp pads and cleaning the stamps. This seems so much more simple! A personalized stamp would be great fun! I have used my stamps with built in ink much more then the others, so this is something I'd like & use. I appreciate The Scrapping Review. I saw someone use this at a crop and she did say that practice makes perfect. I like the idea of interchangeable images. Love to see new innovative products... thanks for the review. Looks like I'll be picking up one of these!! Too cute and love the "ease" to use it and "space" (or lack there of) requirements to store it!! Wow, you've just scratched a little itch for me! I just ran across this product yesterday and thought it sounded fun, but wondered about just the things you covered! I was just looking today for a stam for the back of my cards! I think this is a lovely idea an outer stamp with interchangeable inner-what a great idea! would love to have one!! These sound awesome! I would love to try them. The Hello Kitty is super cute! This is wonderful! I need to check out their website! This might be what I need to get into stamping! hmm, interesting! i'd def like to try 'em out!! If the stamps are high quality, I could definitely see myself using this. The images are cute. What a fabulous idea! I had planned on purchasing some monogrammed name and address stamps as Christmas gifts but missed the cut off date for overseas postage but now I am glad I missed it as these look much better! You are getting much better value for money if they are interchangable and you can alter the look of the stamp - wow! These sounds like a great stamp collection with all the interchangable features. designs especially if it makes a nice crisp image. Looks fun! Thanks for the chance to win! Sounds like a good idea. Thanks for the review. I'll check out their website and learn more about the tool. This sounds very interesting and I would be willing to try them out!! I love that you can change out the stamps and ink colors. And oh my, I see there are Hello Kitty stamps...my nieces would love those! Those stamps are really cool, and I love the licensed images - who wouldn't want to have Snoopy and Hello Kitty at their fingertips? A personalized one would be awesome as well! Thanks for sharing! I wouldn't mind trying these. Sounds like an interesting concept.